The Twilight Series Hot Tub; A Luxurious Experience - Paradise Spas & Outdoors Living | Hot Tub Store, Swim Spas, Patio Furniture, and More! Our hot tub and swim spa Super Store has it all and we are excited to share all that we know about our products. As a luxury hot tub retailer, we carry the highest quality products. One model that we can’t seem to get enough of is the Twilight Series by Master Spas. We’ve told you about some of its amazing features in a previous post so here is a bit more we thought you’d love to hear about. 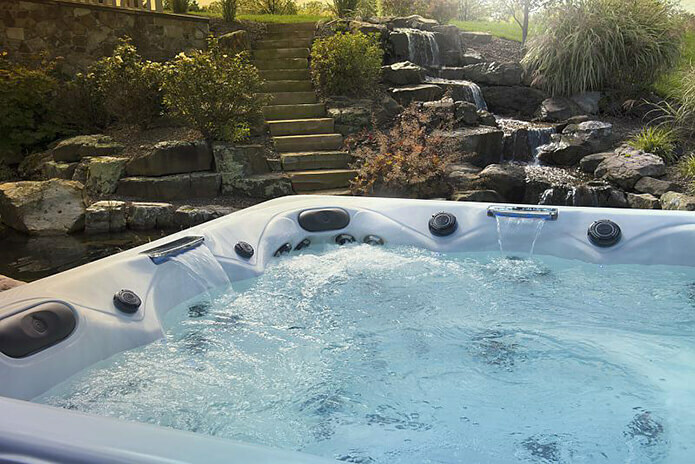 The Twilight Series hot tubs are luxurious perfection offering an experience that includes hydrotherapy for the ultimate relaxation and a sound system of many advantages. Stress Relief- Neck and Shoulder Relief: The unique design of the hydrotherapy neck and shoulder relief jets are guaranteed to melt away your aches and pains. Unlike other hot tubs, these jets are positioned downwards to relieve pressure down your neck and spine, just like getting a real neck massage. You can’t wait to get into your hot tub at thee end of the day for this ultimate pressure relieving power. Xtreme Therapy Seat: Remember when we said you’ll be sitting 90% of the time in your hot tub? This Xtreme Therapy Seating will make you sit 99% of the time. The 22 strategically placed jets with two whirlpools, are sure to make you forget about even the most stressful day. The Xtreme Therapy Seats target your calves, arms, wrists, and hands, while a unique jet pattern is designed for your neck and back. The only thing better is unique controls that let you adjust the jet power to your comfort level. Just sit back, relax, and say “ahhh”. Master Force- Bio- Magnetic Therapy System: Magnetic Therapy is the one thing you never knew you needed. Doctors today prescribe magnetic therapy to take away aches and pains, even arthritis and sports injuries. The Twilight Series Hot Tub uses magnetic therapy by using powerful magnets behind the neck and back to help relieve pain, improve circulation, reduce swelling, and alleviate stiffness. Only with the Twilight Series by Master Spas can you truly see what magnets can do for you. Fusion Touch Sound System: Another optional package, soon becomes a necessity once you read this. This feature is controlled entirely by the hot tub touch pad. The sound system includes: two topside speakers, two external backlit speakers, and a subwoofer for maximum sound quality. You can also connect a phone or tablet and use Bluetooth to stream music, television shows, movies and more. WiFi Module: Or maybe you want to make your hot tub just as smart as your phone. Connect your Apple or Android device, and with the Balboa Water Group WiFi Control App you can control the lighting, water, temperature, and running massage pumps. Noise Reduction System: Quiet is relaxing. Noise is not. That’s why the Twilight Series by Master Spas brings you a quieter, calmer, and more relaxing spa experience with a motor mount brought to you only by Master Spas. Reading about these features is one thing but seeing them in person takes you to another level. Paradise Spas and Outdoor Living proudly carries premium brands such as the Twilight Series by Master Spas and we offer the best possible pricing. Our hot tubs include a variety of sizes and designs that indulge to your desires. As a luxury hot tub retailer, we strive to ensure that if you want a hot tub, you’re able to get one even if you’re on a budget. Come visit our Austin retail store and browse a wide selection of hot tubs and swim spas. We can help you find the perfect ho tub to meet your needs. Consultations are always Free, so call today to learn more!